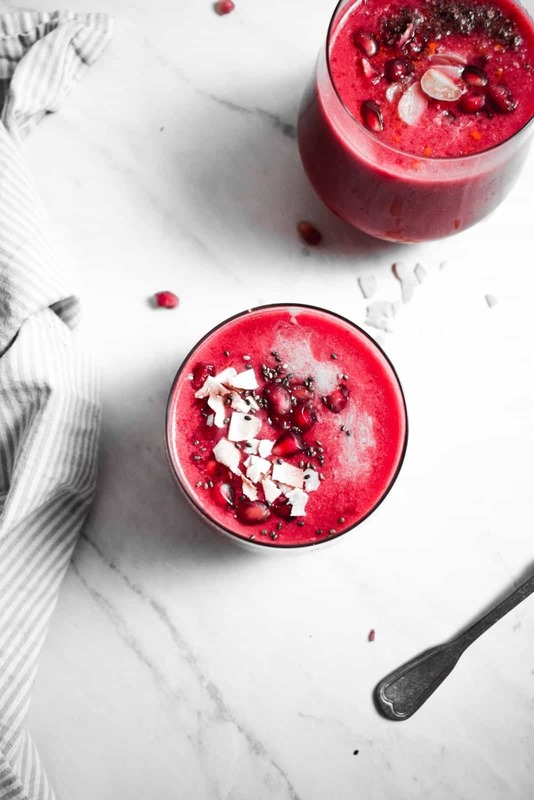 Immune-Boosting Pomegranate Smoothie here to bring you a burst of fresh new energy. 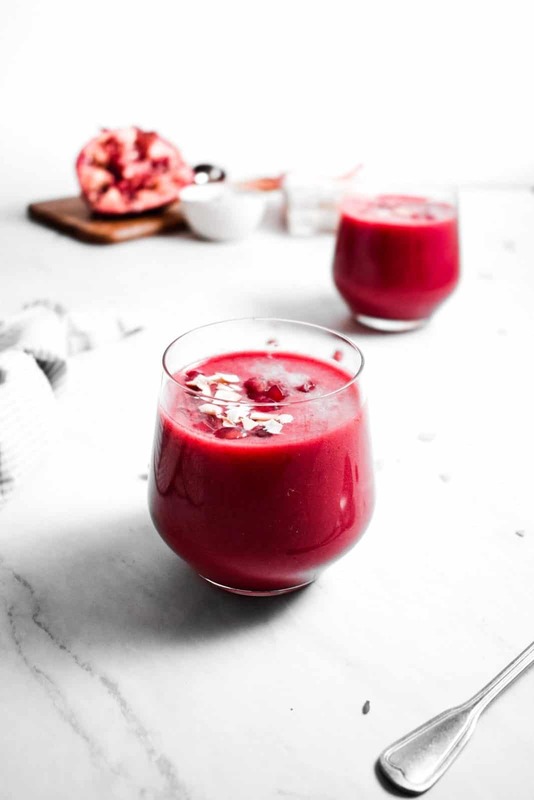 This delicious pomegranate smoothie is made using carefully selected immune-boosting ingredients. It’s packed with all things healthy and will keep you energised for hours. Moreover, it’s the perfect morning smoothie and a refreshing option on warm weekends. Hello spring. It’s that time of the year again. We’re so excited to finally bask in the sun for the first time that we tend to get carried away. And as we know, there’s always a downside. The evenings are considerably colder than we expect and we end up running around without a coat, then coughing and sneezing the day after. Spring is the season of hay fever, colds, unexpected flu and other unwanted health issues. 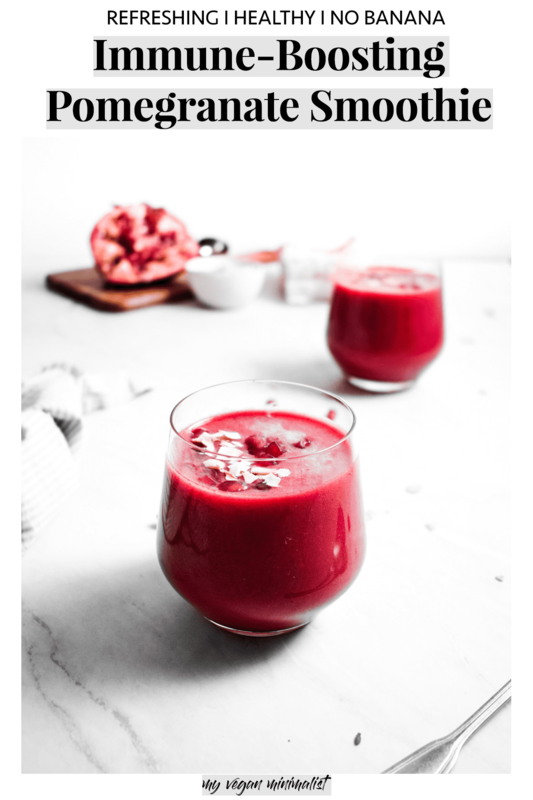 And now, finally, my ultimate immune-boosting pomegranate smoothie! I decided to leave out bananas for this one and focus on berries, coconut and pomegranate. Whilst bananas are a fantastic smoothie base, I find them to be overpowering at times. 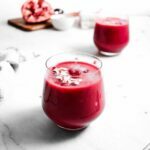 This easy smoothie recipe is for everyone that isn’t a fan of this tropical fruit but still wants to enjoy smoothies. It has a silky smooth and creamy texture, while providing a fresh boost of nutrients. They’re also loaded with anti-inflammatory properties and provide a range of other health benefits. Top off with extra pomegranate arils and coconut flakes.